Pure vanilla extract, vanilla flavoring, imitation vanilla... what's the difference? Can they be used interchangeably in recipes? Is one better than another? Here's the lowdown on this sweet-smelling baking pantry staple. Vanilla beans are expensive, retailing in some specialty shops for as much as $2 to $3 each. The price of pure vanilla extract is also high, but this can vary due to the quality of the beans used to make it. The best vanilla beans are the products of orchids that grow only in tropical climates. Beware of "pure" vanilla extract that seems unusually cheap. If the bargain seems to be too good to be true, it's probably an adulterated extract or the beans were of poor quality. 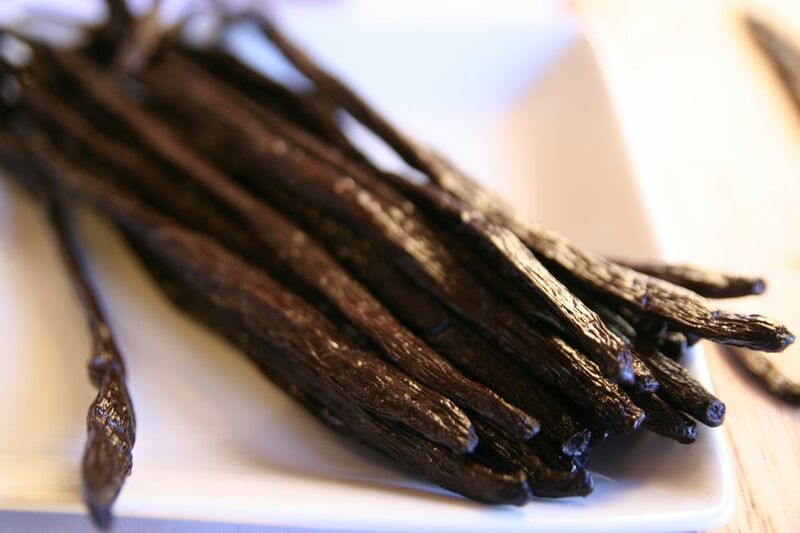 Pure vanilla extract must contain 13.35 ounces of vanilla beans per gallon during extraction. The extract must be 35 percent alcohol to meet FDA standards. These are the minimum requirements. Additional alcohol content is allowed and results in a deeper, richer flavor. By FDA definition, a "pure" extract means that the vanilla flavor can only come from vanilla beans and nothing else. This is a factor that draws a definitive line in the sand between pure extract and imitation vanilla, but it relates only to the vanilla flavor and doesn't necessarily mean that nothing other than vanilla beans contributed to the overall product. It's not uncommon to find vanilla extracts that contain a little sugar or corn syrup, and this is perfectly legal because neither contributes to that vanilla taste. Pure vanilla extract that has no added sugar or corn syrup will last forever, aging like a fine liquor. The older the extract is, the better. It's less bitter, even without the help of those sweeteners. Imitation vanilla is made from artificial flavorings, which isn't surprising. What might raise your eyebrows is that most of these artificial flavorings come from wood byproducts, and these byproducts can contain chemicals. Discerning palates usually find that imitation vanilla products have a harsh quality with a slightly bitter aftertaste. If you're tempted to substitute imitation vanilla for pure vanilla extract in a recipe you'll need twice as much imitation vanilla flavoring to match the strength of pure vanilla extract, but this comes with a risk. Imitation vanilla is typically made with synthetic vanillin extracted from wood pulp, so you lose the gentle vanilla hint that you'd get with the real deal. In other words, pure vanilla extract packs more into less. This might be okay if the focus of the recipe isn't its vanilla flavoring; otherwise, you'll probably want to spend more for pure vanilla extract. Vanilla flavoring is usually a combination of imitation vanilla and pure vanilla extract. It's cheap, but that may be the best that can be said for it.